This past summer, we were pleased to host Flat Aggie on our dairy farm. Originally from a classroom in California, Flat Aggie spent time with us learning how to milk cows and do a few other summertime farm chores. Well, ol' Flat Aggie must have had a really good time because he sent his cousin (also named Flat Aggie) to pay us a visit last week. So I took my new friend along with me to milk cows and plant ryegrass seed. Our day started at 3:00am in the milking barn. Flat Aggie was able to get a close-up view of the action. He watched as we cleaned each cow's udder and then attached the milking machines. We milked 172 cows that morning and finished at 6:30am. Once we finished breakfast, Flat Aggie and I poured ryegrass seed into a type of planter known as a grain drill. Ryegrass grows during the cooler months of the year and makes great cow food! We spent all morning planting the ryegrass seed into hay fields. In late spring, I will harvest the ryegrass and feed it to my milk cows. Once the afternoon rolled around, it was time to milk the cows again. Flat Aggie found a good spot to sit back and enjoy watching all of the action. Flat Aggie even took the time to chat with one of our dairy cows before the day was finished. I really enjoyed having Flat Aggie spend time with me, and I think he learned a little bit about life on an Alabama dairy farm. He said the kids back in California would be eager to hear about his visit, and that he was going to make a point of teaching them how to sing "Have a Dairy, Merry Christmas" once he returned to them. "But before I go home," said Flat Aggie, "I want to go on another farm adventure or two." And with that, we shook hands and Flat Aggie headed toward North Dakota. A big ol' "Thank You!" Today is the last day of online voting in the USFRA's "Faces of Farming & Ranching" contest, and I want to thank everyone who has taken the time to register and participate over the past month. I especially appreciate those of you who voted for the dairy farmer from Alabama, and please know that your words of encouragement and expressions of support have meant a lot to me. The contest winners will be announced next month, and I am convinced that America's farmers and ranchers will be extremely well-represented regardless of whether or not my name is included in that list. The other eight finalists are all outstanding agriculturalists, wonderful advocates, and just flat-out good folks. To tell you the truth, I haven't been too keen on my chances since meeting and interacting with them in New York City last month, but I've been totally comfortable with it. That's how good these folks are at what they do! The one big thing I've learned through this process is that the way I go about sharing my story apparently does have an impact. I don't know if "validation" is the right word, but advancing to the finals of this contest and seeing how many people have supported me along the way tells me that I'm helping people understand life on a dairy farm and how the milk they enjoy is produced. And that's something I really take pride in. "Thank your for your support!" I've been fortunate enough in the past to hold positions and receive honors that have given me a platform to reach more people than I would have otherwise, and perhaps I will have similar opportunities in the future. At the end of the day though, I'm just a guy that loves being a farmer and enjoys giving you a glimpse of what goes on around here. Whether "my story" reaches 50 people or 50 million, it has reached you and that's what's important to me. I hope I've been able to help you understand a little something about dairy farming and modern agriculture along the way, and maybe that I've even made you smile or chuckle a time or two. Now get out there, buy some milk, and enjoy it and other safe, delicious, nutritious dairy products three times every day! And from the bottom of my heart...thank you, and have a "dairy" good day! Is rural America less relevant? US Secretary of Agriculture Tom Vilsack made a statement last week that rural America is becoming "less and less relevant". After reading the article in which his comments were published, I have to assume he was referring to rural America's diminishing political clout and not making a sweeping statement that we simply don't matter any more. But let's explore both possibilities. I first became aware of the Secretary's statements when Tim Lennox, a Montgomery television news anchor, asked me via Twitter Sunday morning to add a comment about it on his blog. I skimmed through the linked article and in my comment agreed that the failure (thus far) to get a new Farm Bill passed does show that agricultural and rural development programs aren't given the legislative priority they were once afforded. I also mentioned that we in agriculture need to continue building relationships with consumers to the point that hopefully they would advocate with us for workable farm policy. Fast forward to Monday. About halfway through the afternoon milking I received a call from a reporter in Washington, DC, asking if I would be willing to chat for 5-10 minutes about the Secretary's comments. I stepped outside, reiterated my thoughts about rural America's political influence, and shared a little bit of my own farming story. That reporter's article was published online today by...of all things...a Russian news agency. You can read it here if you so desire. This evening, I went back and re-read the original article. There are a couple of things Vilsack said that I strongly disagree with. One is that we shouldn't be spending our time fighting to keep the EPA from regulating farm dust or the Department of Labor from telling us what our kids can and can't do on our farms. Maybe the Administration never intended for either of those things to happen, but I won't apologize for not trusting regulations that give wiggle-room to overzealous bureaucrats. The other statement that I take issue with is that we rural Americans have to change our mindset in order to attract more young people into farming. What am I, chopped liver? I know plenty of folks my age and younger that are excited to meet the challenges and take advantage of the opportunities American agriculture will offer over the next half-century. Could we stand to have more folks involved in food production? Absolutely! But don't discount the ability of those of us already and soon-to-be involved in farming to get the job done. As I take a deep breath and wrap this post up, I'll go back to the question of whether or not Vilsack's comments were specific to rural America's political influence or relevancy in general. I think it was the former and not the latter, because to say rural America no longer matters would be completely absurd! Yeah, people continue to move out of the country and into the cities, and maybe we don't have the clout in DC that we once had. But rural Americans...farmers, community bankers, small business owners, truck drivers, etc...are still critical to the strength of our great country. In fact, I would say we are more relevant than ever. I'm just got in from the milking barn on Saturday morning and thought I'd share a little bit about what's been going on this past week. We've had two dry cows and two heifers give birth this week, running our total number of cows in our active milking herd up to 177. They have been slowly inching up on milk production and should bump up a little more once cold weather sets in. Their TMR diet currently consists of corn silage, bermudagrass hay, wet brewers grains, and a custom mix of ground corn, soy products, dried distillers grains, etc. that we purchase from a feed mill. Weather-wise, we've had damp and mild conditions most of the week. The wet conditions have prevented us from planting any ryegrass this week, but the wheat and rye we've already planted is really benefiting from the moisture and the temperature. And since we couldn't do anything in the field, we turned our attention Thursday morning to our beaver problem. Beavers have built dams all up and down a small creek that runs through our farm, causing water to back up into and flood one of our pastures. We busted four dams and "let the water off", but we still have at least three more to tear out. The Tuscaloosa News ran a story in their Sunday edition's Business section about me being named a finalist in the USFRA's "Faces of Farming & Ranching" contest. Read the story here, and don't forget to vote for me every day through December 15! My dad and I left the farm in the hands of our farmhands during the first part of the week so we could attend the Alabama Farmers Federation's Annual Meeting in Montgomery. You can watch this nice wrap-up video to hear from our organization's new president, meet our new Outstanding Young Farm Family, and learn how much money was raised for the Foundation for Agriculture. Speaking of videos, I have followed up 2009's "The Gilmer Dairy Farm Christmas Song" with a new one entitled "Have a Dairy, Merry Christmas" and I hope you like it. If you do, be sure to hit the "like" button on YouTube. It's been entered into Proud to Dairy's holiday song contest, and the video with the most "likes", G+'s, & "favorites" wins. And remember, sharing any of my crazy videos with your friends is sure to bring them holiday cheer! Have a "dairy" good weekend, y'all! I got bored one day last week while planting rye seed into a hay field. And as is the case when I get bored, my mind starts coming up with strange things. In this case, it was bending the words of "Have a Holly Jolly Christmas" into something dairy related. I came up with a new version of the song pretty quickly, but decided to wait until this week to shoot some video and piece it all together. What I didn't know at the time was that the Peterson Brothers in Kansas were going to come out with another one of their farm parody videos. I nearly decided just to scrap my little project when I saw their new one online last night, but I decided to go ahead and publish mine anyway. It may not be well-produced, have mass appeal, or receive a fraction of the attention some other videos receive, but what the heck! "Have a Dairy, Merry Christmas" has all the key characteristics of my other song videos: I made it up, I made it on the cheap, and I made it with a message. Yeah, it's low (no) budget and the audio track isn't anywhere close to being in sync with the video, but it does have cows, a Santa hat, and it comes from my heart. I hope you enjoy it. And if you can't laugh with me, it is completely understandable and acceptable to laugh at me. Have a dairy, Merry Christmas! It's the best time of the year. In your cereal bowl or your cup of Joe, add milk for holiday cheer. Ask for cheese...it's sure to please...and have ice cream as a treat. Ho, Ho, don't you know Santa comes on Christmas Eve! So pour him a glass of milk to enjoy before he leaves. Don't be contrary have a dairy, Merry Christmas this year! Ho, Ho, don't you know quality is guaranteed. 'Cause the cows are milked with pride for you by dairy farmers just like me! "We interrupt this family gathering..."
My family gathered together at my parents' home for our traditional Thanksgiving meal on Friday evening. Mom had cooked just about everything one could hope for: turkey, ham, dressing, gravy, cranberry sauce, mashed potatoes, sweet potato casserole, green beans, rolls, and deviled eggs (I ate eight). After feasting on the great meal that had been set before us, we all excused ourselves from the dining room and eventually congregated in the living room to watch a subpar, non-SEC college football game. 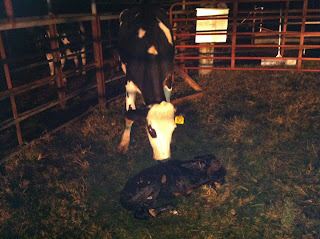 Dad stepped out a few minutes later to check on a heifer we had suspected was in labor earlier in the day. Sure enough, she was in labor and was going to need our help with the process. So Dad, my brother-in-law, and I all scarfed down some dessert, put on our heavy coveralls, and headed up the road to the dairy. Once we arrived, we secured the two-year-old heifer into our catch-pen's chute and began to help her deliver. The calf was turned correctly and wasn't unusually big, it was just as if the heifer had decided the calf should do all of the work and get out by itself. Regardless, we had him safely out within a matter of a few minutes. We left the new cow and her bull calf alone to spend the evening together as we went back to rejoin the rest of the family and resume falling asleep in the living room. Some might see the interuption of a family gathering to pull a calf, chase mischievous heifers back into their pasture, or address any other possible "emergency" farm chore as an unwelcome aggravation. For this dairy farm family, though, it's just part of life. It's Thanksgiving Day, or as we refer to it on our farm: Thursday. Just kidding. Yes, the essential farm chores...milking, feeding, keeping the equipment clean...must be completed just like every day, but we will take a little time off from our normal daily schedule. Our farmhands are only going to work for a couple of hours this morning, then my dad and I will handle the afternoon milking while watching the football games on our barn's old television (that's right!). We won't have our big family Thanksgiving feast until tomorrow evening, but I'm sure we'll still manage to eat well today and will certainly take a little time to reflect on how we've been blessed beyond measure. Whether you are going to spend your Thanksgiving eating, traveling, hunting, shopping, working, relaxing, serving others, voting for me in the Faces of Farming & Ranching contest (I had to throw that in there), doing a lot, doing a little, or doing nothing at all, I hope you have wonderful, blessed, and happy Thanksgiving! It's good to be back home on the dairy farm after a couple of days in New York City. New York City?!?!?!? Probably reminds you of that old line, "Country Comes to Town", doesn't it! At any rate, my wife and I flew up to the Big Apple on Wednesday to attend the US Farmers & Ranchers Alliance's (@USFRA) "Food Dialogues" event held on Thursday. There were three 90-minute panel discussions about some of the most critical questions being asked about our food system: healthy choices, antibiotics, and biotechnology. All three of these discussions have been posted online for you to view at your convenience. But we were not there just to passively sit in the audience. The USFRA launched a "Faces of Farming & Ranching" contest earlier this year, and farmers and ranchers from all over the country submitted contest applications and videos this Summer and early Fall. Semifinalists were chosen from among the big list of applicants, and then that list was narrowed down to nine finalists a few weeks ago. I was humbled and honored to be one of the nine finalists officially announced at the conclusion of the second Food Dialogues panel discussion. You can watch a video of the official announcement here. We each went through an interview process yesterday evening, and the scoring of those interviews will go a long way in determining the winners of the contest. There is an online voting component, though, which will allow you to support your favorite finalist. Once you register on the site, you can cast one vote per day through December 15, and I would certainly appreciate any and all support you can give me! I would encourage you to check out all the bios and videos of each finalist. After getting to know them, I know our industry, values, and way of life will be very well represented by whomever is selected as a winner. 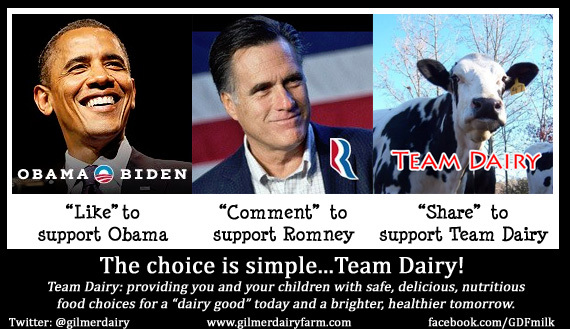 Thanks for your support, and have a "dairy" good Thanksgiving season! 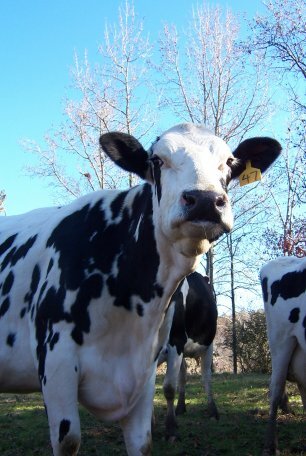 It was a beautiful late-September day in 2009, and the air was alive with the sounds and smells of the dairy farm. I was engaged in the rather monotonous job of filling our honeywagon up with manure at our storage tank, discharging it on hay fields, and returning for another round. With no working radio in the tractor to distract me from my boredom, I began to entertain myself by making up song lyrics describing what I was doing. As word after word, line after line started coming together to an old country music tune, I realized that I was crafting something that could potentially entertain and educate people about what I was doing in the field that day. After a couple of hours of thoughtful composition and rehearsal I pulled into a field with a full load, pulled out my smartphone, pressed the "record" button on its video camera, and the rest is history. Three years later, I just smile and shake my head when I think about "Water 'n Poo". While I thought a few people might enjoy the novelty of it, I never expected it to be more popular than the other farm videos I had posted in the previous months. And while it easily accounts today for far more "views" than any other video I have ever published, the statistics aren't the measuring stick by which I gauge its impact. I cannot tell you how many times I've been asked, "You're that Water 'n Poo guy, aren't you? "...I swear I've met at least a quarter of the people who have seen it! I have been told many times via text and Twitter (as recently as today, in fact) that so-and-so was showing it as part of his or her presentation to such-and-such group. And I figure it is at least indirectly responsible for half of the interview and speaking requests I've received since I published it. So for better or worse, me and that video are pretty well tied together in people's minds. And based on the feedback I've received, it's been relatively successful in accomplishing the two primary goals of all of my videos: showing folks the good things that are happening on my farm and encouraging other farmers to do the same. For all the attention "Water 'n Poo" has brought my way, it has about run its course and will eventually reside in that dusty corner of the internet where it will only be seen by folks who accidentally happen upon it. I'm afraid it doesn't have enough "depth of message" to enjoy the same staying power of some farm videos or the glitzy production value and mainstream appeal of some others. But it is what it is: raw, simple, and genuine. It reminds me of a time when using social media seemed more like an exciting exploration than a routine obligation, and I had a blast making it! I want to thank all you folks who have taken 2 minutes and 32 seconds out of your busy lives to watch it, and I hope you enjoyed learning a little bit about nutrient management along the way. Heavy rain earlier this week forced us to shut down our harvesting for a couple of days, but we're back in business on two fronts: sudex and bermudagrass. We started harvesting the sudex (sorghum-sudangrass) on Monday morning, hitting the field just an hour before the rain started falling. Harvesting this tall, thin, and densely-planted crop requires it to be mowed with a hay conditioner before being run through the silage chopper (as we're doing) or hay baler. Timing wise, it's providing us with a transition crop between the June-planted forage sorghum we finished harvesting last week and the almost-ready-to-harvest sorghum we planted in July. We resumed chopping on Wednesday, and should finish with the sudex either Monday or Tuesday of next week before switching back to sorghum. We're also in the hay fields this week. Early Friday afternoon of last week we started noticing an unusually high number of crows flying around. Upon further investigation, our worst fears were confirmed: army worms! We decided we wouldn't be able to spray quickly enough to avoid major damage, so my father and I cut four hay fields Friday night and Saturday morning. As expected, Monday's rain came before the hay could dry enough to bale, but we "fluffed" it to dry it out yesterday. Lots of sunshine and low humidity did the trick, and we're raking and baling half this evening and the other half tomorrow afternoon. If you'd like a couple of more details click "play" on our latest GDF MooTube Minute below. And just one quick little note about our cows, we're currently milking 163 after the latest round of calvings/dry-offs/culls. I'm gonna go roll up some hay bales now...y'all have a "dairy" good evening! I disengaged the silage chopper as a dump truck carried out the last load of corn silage from our bottomland at 3:00pm this afternoon. After 74 loads cut off of 45 acres over the course of 15 days, I was glad to finally be able to close the book on the 2012 corn crop. When considering what many other farmers across the country have suffered through this summer, I shouldn't be too disappointed with the result. After all, a marginal crop is much, much better than no crop at all. But it really was a sub-par yield for us, probably around 75% of our average yield and only 60% of last year's exceptional crop. Taking 15 calendar days to get in 6 actual days of harvesting (due to rain/wet ground) certainly didn't help the forage quality either, as the last third of the crop had matured and dried down significantly by the time we could chop it. As I said though, it's not great but it is something. The crop didn't burn up to a complete loss due to drought, and it wasn't so wet in the bottom that we couldn't harvest it at all (as was the case with our sorghum in '09). So now we turn our harvesting attention squarely to our forage sorghum, and then on to sudex and bermudagrass hay. Will we go into the winter carrying as much total forage as last year? I dunno...I kind of doubt it. But we'll do the best we can with what we have to keep our cows and heifers healthy and happy, all so we can continue to provide you with high-quality milk and keep on doing what we love. It's not always easy, but it's worth the fight! Early last week our milking herd "bottomed out" at 140 cows. That number marked not only our lowest herd count of the summer but also of the past nine years. There are several reasons for the larger-than-normal summertime dip, including our decisions to send several older cows to the beef market this past Spring and to "dry off" some of our lower producing pregnant cows a little earlier than normal. We are seeing that number start to climb now, however, as we have come to the beginning of a long calving season. Since last Wednesday, we've had six different cows and heifers calve and join the milking herd. Another 23 are due within the next two weeks, with another 20 due the second half of September. The fun doesn't stop there, though, as we expect near-steady calving activity through the early part of December. Yes, we'll still be drying off some cows and culling a few others along the way, but our climb back up to 200ish cows in milk has officially begun. While we're keeping a close eye on the maternity pasture, we're also paying close attention to weather forecasts associated with soon-to-be Hurricane Isaac. Based on the current projections, it looks like the storm will be far enough west of us not to worry about any damage, but the rain associated with is a real issue. Our silage corn is ready to chop, and with a little luck we could be in the field harvesting sometime tomorrow...COULD be in the field. If mid-week looks to be a washout, there's really no point in trying to chop for a day with the expectation that we wouldn't be able to harvest again until next week. I have yet to see any rain forecasts agree on when we should expect it and how much we should expect to get, so our planning is currently stuck in neutral. Hopefully we'll have a clearer picture by tomorrow morning. In closing, I'd like to ask that you continue to keep all of our country's farmers and ranchers in your prayers. Unfavorable weather, economics, politics, etc. have made it a difficult year for many, many farm families across America, and your support is needed and appreciated now as much as ever. God bless, and have a "dairy" good day! Timely and adequate rainfall over the past few weeks really helped our silage crops, hay fields, and pastures, even while much of the country is still suffering through one of the worst droughts in many years. After a slow start, the corn and forage sorghum we planted late-May/early-June has really come along and isn't too far away from being ready to chop for silage. With 65 acres worth of hay planned to harvest over the next six weeks, we're only 60 round bales away from matching all of last year's total. And even though it still has a long way to go, the forage sorghum and sudex we planted in mid-July is off to a good start and should prove to be a good crop if we can get "normal" weather conditions over the next 2-3 months. We had the honor of hosting a visitor named Flat Aggie a few weeks ago. If you have never heard of him, perhaps you have heard of his cousin, Flat Stanley. Flat Aggie is originally from California and is currently making a series of farm visits all across the country. In fact, he had just learned about cotton, peanuts, and poultry at Miller Farms in Boaz, Alabama, before coming our way. I'd like to show you a few photos of Flat Aggie on our farm. As you will see, he made himself very useful and I'm glad to have had both his company and his assistance! Flat Aggie endeared himself to me right from the start. We begin milking our cows at 3:00am each morning, and he already had a cup of coffee waiting for me the first morning of his visit. In the milking parlor, Flat Aggie found a good spot where he could observe the whole process. He watched us clean and sanitize the cows' teats, attach the milking machines, and apply a protective dip to their teats once they were finished. Before all the cows had been milked, Flat Aggie stepped out of the barn with me so we could put the cows' feed in their trough. 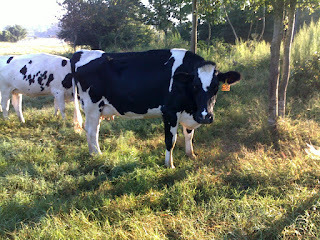 We fed the cows a breakfast consisting of a mix of ryegrass silage, bermudagrass hay, and a corn/soy-based dairy feed. After we had our own breakfast, The local large-animal veterinarian came to the farm to examine several cows for pregnancies. Flat Aggie had a good view of the Vet and his ultrasound machine. Later on in the day, Flat Aggie and I prepared to apply herbicide to a field of forage sorghum. We didn't have any protective gear small enough to fit Aggie, so he had to stay in the tractor while I filled up the tanks. Once we got to the field, Flat Aggie was a big help...I did the diving and he turned the sprayer switches on and off for me. We made quite the team! Flat Aggie spent another couple of days visiting Gilmer Dairy Farm before heading off to the next stop on his grand adventure. I'm not sure where exactly he'll end up next, but he did mention that he would love to see a little bit of the Mississippi Delta now that he could check Lamar County, Alabama, off his list. Like much of the rest of the country, rain has been a scarce commodity over the past few weeks. Our silage corn and the sorghum we've planted is off to a slow start, and our bermudagrass hay fields and pastures are more or less just sitting there. A half-inch of rain last week did perk the plants up a little bit, but we need more and we need it fast. Hopefully the current weather forecast, which is predicting a pretty decent chance for rain this week, will bear out. Our cows and heifers have kept us busy while we've been waiting on rain, at least. Over the past few weeks we've given all our animals their annual vaccination boosters and have moved many of them into fresh pastures. Our milking herd continues to decrease in numbers as pregnant cows are being "dried off" faster than dry cows are calving back in. We currently stand at 161 cows in milk, with several due to dry off next week. We'll be back in the field planting the remainder of our sorghum and sudex crops as soon as we receive enough rain to loosen the ground. Until then, we'll keep waiting and watching and praying for some relief. 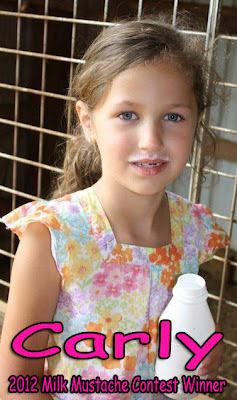 We at Gilmer Dairy Farm are proud to announce that Carly, a six-year-old girl from right here in Alabama, is our Milk Mustache Contest winner for 2012! Carly received 202 of the 370 total votes cast last week on our farm's Facebook page. For winning, she'll receive a dairy-themed prize package and will be our "poster child" for the remainder of June Dairy Month. We would like to thank everyone who submitted a photo for our contest, as well as all the people who took the time to support their favorite milk mustache photo during our fan voting. We are very happy with this year's level of participation, and hope that we get even more photos and votes next year! We'll even begin accepting submissions for next year's contest right away. Enjoy the remainder of June Dairy Month, and make sure you're getting your "3 Every Day" of milk, cheese, and/or yogurt! It's June, which is of course celebrated as Dairy Month all across this great land of ours! I hope each of you will celebrate daily with at least three servings of delicious, nutritious milk, cheese, or yogurt. Heck, throw some ice cream in there as well! I promise that if you'll celebrate Dairy Month with "3 Every Day" you'll likely want to keep celebrating year round. That would be awesome (for you and me)!!! Things are busy, busy, busy here on the farm. We planted our silage corn a couple of weeks ago, and it looks really promising at this early stage. I'm in the process of planing our forage sorghum (which we'll also harvest for silage), and should have half of it planted by the end of the day. Apart from the planting, I've been giving the tractor a workout applying fertilizer and spraying weed killer in and around our various silage fields, hay fields, and pastures. The downside of June is that it is one of our most expensive months. On one hand we have all the costs associated with growing and harvesting our animals' forages, and on the other we have the reality that milk production (and the price we receive for milk) is going down. This is nothing new, though, so we know how to plan for it. Speaking of the drop in production, we're getting to the point where we'll be "drying off" pregnant cows nearly every week. Eight left the herd for a two month vacation on Tuesday, and three or four will be following next week. We're currently milking 176 cows, and I can see that number possibly dropping below 160 sometime this summer. Time will tell. Listen for me and other Southeastern dairy farmers on your local radio stations this month as we share how we're "Dedicated to Dairy" during Dairy Month. Speaking of radio, I might be doing a Dairy Month-related radio and/or television interview sometime next week. I'll be sure to let you know once as I get more info. Don't forget to click over to our farm's Facebook Page and enter our Milk Mustache Contest. Time's running out, so don't delay! Speaking of contests, so me a favor and vote for Mississippi State's Muscadine Ripple Ice Cream this week in Progressive Dairyman's 2012 Flavor Faceoff. Thanks, and y'all have a "Dairy" good week! Cows, like all living creatures that I’m aware of, naturally produce hormones in their bodies. Some of these hormones are found at very low (and very safe) levels in cows’ milk. Therefore, any dairy product you buy… whole milk, skim milk, “organic” milk, cheese, yogurt, etc…will contain traces of these naturally-occurring hormones. Perhaps where the issue has gotten confusing is in the use of supplemental rBST and the labeling of rBST-free milk. Bovine Somatotropin is a protein hormone naturally produced in the pituitary gland of all dairy cattle. Supplemental levels of the hormone’s recombinant form (rBST) can be given to cows during certain times of their lactation to increase milk production. Essentially, the supplement helps a cow convert feed into milk more efficiently. The advantage to using rBST is that it can help a dairy produce more milk without adding more cows to the herd or growing/buying additional feed. The level of success of the supplement often depends on other factors such as feed quality and environment. We used rBST for a short time in our milking herd but did not see enough of a milk increase to warrant its continued use. Due to that economic decision, our herd has been “rBST-free” now for well over 10 years. Numerous scientific studies have concluded that there is no difference in safety or nutrition between the milk and meat from cows that receive supplemental rBST and those that don’t. 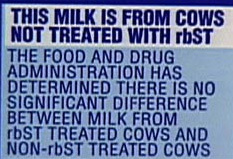 Despite this fact, many consumers have voiced their preference for milk from cows that have not received rBST supplements. As a result, several dairy processing companies have worked with cooperatives and individual dairies to secure an “rBST-free” milk supply. Many of these companies then include information on their milk jug labels or dairy food packaging identifying the product as rBST-free or containing "no artificial growth hormones". The next time you’re standing at the dairy case in your local grocery store, please remember that ALL the milk you see before you is safe and nutritious. Ultimately, the best dairy milk for you is whichever variety you enjoy the most, so make sure you’re including three servings of dairy products every day as part of your healthy diet!